This post looks at a 2015 paper jointly led by Freek Spitaels (Gent U) and Simon Van Kerrebroeck (VU Brussels) who, with their co-authors, looked at the characteristics of bottled Cantillon gueuze of different vintages. The study was conducted in 2013 and the following gueuze samples were tested (years listed are bottling years): 2013 (one month in the bottle), 2011, 2010, 2008, 2004, and 1996. The authors also looked at 3 year old lambic to add to Spitaels's previous work on Cantillon lambic that stopped at 2 years old. As mentioned above, Freek Spitaels has done some great work recently with Belgian lambic. I've seen two of his papers got some attention in the homebrewing and beer enthusiast world - one on the microbial succession of aging and fermenting lambic at Cantillon and the other following the same thing at a more industrial producer. For practicality, this paper looks at different blendings of gueuze which are of different ages rather than following one blending through time as it aged. The latter of course would be quite interesting - to properly follow the evolution of one blend. But 17 years of data collection is a pretty intense task. And it would be difficult to remain sufficiently consistent in a rapidly growing field such as those utilizing microbe biomarkers. And of course, the most important reason, it would not allow the comparative taste tests. I quite like reading brewing scientific literature, though its not always that I find something that has a direct impact on me as a brewer/beer drinker. I'll often learn what is happening at given points and why the things that brewers do work. And that's not to say that I don't ever read a paper and think to myself that I'm going to do this new thing. And it's also not to devalue the papers that I don't come away from with a practical take away change in my brewing process. Those are still useful in understanding what is happening, which could help me down the line to change stuff (and it is something that I am intellectually interested in anyway). But with this paper, I both learned about what is going on and took away clear useful information for both brewing and as a consumer. 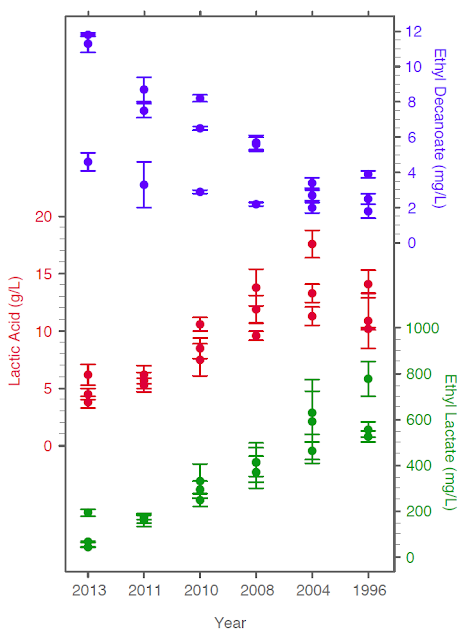 I want to give a quick thanks to my friend an fellow homebrewer/trace metal ocean scientist Dave S who helped me by putting together a nicer figure than the janky plots you may have seen in the first couple hours of this post being up. Ok, so here are some of the highlights to me. The authors found no culturable bacteria (by direct plating or enrichment) beyond 3 years in the bottle, but found culturable yeast in all the bottles. This was from directly plating dregs in the younger bottles but generally culturable microbes were only found after an enrichment process (30 mL filtered, then grown in media before plating). The authors term this viable but not culturable. The culturable/viable bacteria in younger bottles were generally Pediococcus damnosus and some acetic acid bacteria. Viable yeast were mainly Dekkera (Brettanomyces) and were mostly D. bruxellensis, with some D. custersianus, and D. anomala, and with variability by year. Saccharomyces and Pichia isolates were found in 2013 gueuze after enrichment (not in direct plating). Starting with gueuze that had been bottled 2+ years, yeast were only cultured after enrichment. And in bottles that were 5 years old and older, only D. brux. was isolated. The enrichment process may not be terribly dissimilar from a homebrewer pouring dregs into a small starter. Of course the lab is better set up to do this sort of thing with specific media, incubators, and general clean handling and culturing equipment. But the general idea remains the same - put the dregs in some liquid to try to get more viable microbes. So if, at home, you are trying to grow up some rather old dregs from an excellent and fairly old bottle of gueuze, you might find some yeast cells but you might also be better served by directing your efforts elsewhere. First off, if any viable microbes are present they (at best) will only be a piece of what produced that flavor and will only be a small group of what was active in the bottle. And as the number of viable cells goes down the likelihood of you contaminating your culture and having something you introduced take hold goes up. So perhaps you're culturing your house or something from the lip of the bottle rather than the dregs you're after. 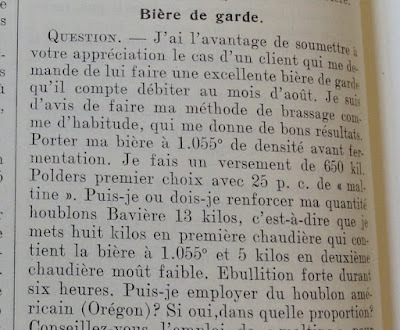 It says something that people who are well trained to grow microbes and who have a full lab to help them do so were not able to culture any bacteria out of bottles older than three years and were only able to culture yeast after enrichment from all but the youngest gueuze. In younger gueuze the authors found a greater abundance of bacteria. In gueuze in the bottle for a few months there were about 1000 times more bacterial colony forming units (CFU, roughly equivalent to viable cells) than yeast CFU per mL. This contrasts 3 year old lambic, which has comparable levels or slightly more yeast than bacteria CFU. As shown by isolates from the bottles, as the gueuze aged in the bottle the balance of viable cells shifted toward yeast. In addition to the microbial data, the researchers also looked at changes in some flavor and aroma compounds. Lactic acid and ethyl lactate concentrations increased with aging while ethyl decanoate and isoamyl acetate decreased with age. Increasing lactic acid concentrations make sense with live lactic acid bacteria and carbohydrates in bottled gueuze. The lactic acid concentrations seem to level off around 2008, which also happens to be the point at which the researchers no longer find viable lactic acid bacteria. Ethyl esters can be synthesized by brett, so continued development of ethyl lactate in the bottle (especially as lactic acid concentrations increase) also make sense. And brett has been shown to lower isoamyl acetate levels. The tasting panel found the older gueuze to be less fruity, which matches with the ester data from these bottles compared to younger bottles. In addition to the role of age, some of these trends may also be influenced by changes in lambic production over time. 17 years is long enough that there might be some minor changes in terms of preferred blends and also practices in barrel management as well as potentially brewing process and ingredients. And this range also covers the passing of the lead production role from father to son (Jean Van Roy started brewing on his own in the F season, 2002-2003). On the beer consumer side, the big take-away was that the tasting panel preferred the 5 year old gueuze (as a reminder, they looked at 6 different gueuzes between the ages of 1 month and 17 years in the bottle). Speaking from personal experience, while certainly less thorough and not doing this side by side, I generally agree with this assessment. As far as aging goes I tend to prefer Cantillon on the younger side while I might prefer geuze from other producers with a bit more age. This could easily be influenced by choices in blending, and specifics of the brewing process in addition to the different native microbe community for each lambic brewer. But whatever the case, and although I definitely couldn't put a specific age as my optimal, I personally prefer Cantillon more in the range from release to a few years old rather than approaching or more than 10 years old. Looking at the specifics of the three bottles tested per year, there is a lot of intra-year variability. I presume that all the bottles were taken from the same blending, so this is a surprising range covered by the bottles. Perhaps this has to do with small differences in packaging. And Cantillon got a new bottling line in December 2013 so all the beers from this study predate that and perhaps the new setup will limit this sort of variability in the future. But it was interesting to see that some bottles from the same year had up to 60% more lactic acid than others and up to twice as much acetic acid. Flavor- and aroma-active esters had similar differences, and in some cases bottles of one year had up to 4x higher levels of certain compounds than others. I guess this goes to show that each bottle of lambic is a unique product. I suspect this remains true even with identical treatment at filling as there will be differences depending on the variable integrity of corks and small changes in storage temperature. The authors also discuss sugar composition in the aging gueuzes, with longer chain carbohydrates being consumed during aging (starting with the simplest remaining). This gives some additional idea of the sorts of sugars that brett and bacteria can ferment and the rate to which they do this when there is nothing else left. The authors looked at DNA in the samples to give an idea of the microbes present that they might not have been able to isolate (but not whether or not they were still alive, as this technique wouldn't be able to determine that). This technique found a wider range of stuff, including some organisms that we don't think of making it very far into lambic fermentation like enterobacteria. Perhaps these cells got into the final product sometime during transfer or bottling. Again, this technique does not determine if cells are living and these things didn't show up in the culturable cells, but the presence of a more diverse range of stuff might indicate that some of the organisms whose DNA they detected played a role in bottle conditioning and/or flavor development. Finally, with all the attention paid to fermentation and conditioning in barrels, I think it is cool to see a study highlighting changes that go on in the bottle. Especially with a beer such as lambic that ages well and that people may try to keep various vintages of for aging. The value of bottle conditioning and some extra time in the bottle is not unique to lambic. Some saison brewers are particular about the length of time and manner in which their beer ages in bottles before it is released. And I think keeping in mind the value of live beer in the bottle and the changes that continue to happen after carbonation has developed is helpful for the brewer who is interested in making excellent beers inspired by saison and lambic.